There you go. I’ve said it. You will probably start screaming at me for saying that but that’s how I feel. Or at least in part. When you see how many fans there seems to be out there you do wonder why it was cancelled. It was “cut short” mainly due to its viewing figures not being good enough to be picked up for a second season. Don’t keep going on about it being cancelled if you found out about the series when it arrived on DVD and you heard about it in an internet chatroom – this was in the days before twitter and Facebook! Sometimes if you hear from, what seems to be, the Sagans of fans go on and on about it being only one season long and they mourning the loss after that singe season. If they had watched it when it was originally on it probably had gone onto having another season or two. Without viewing figures, even the “best sci-fi series ever” would never have made it more than a single season. 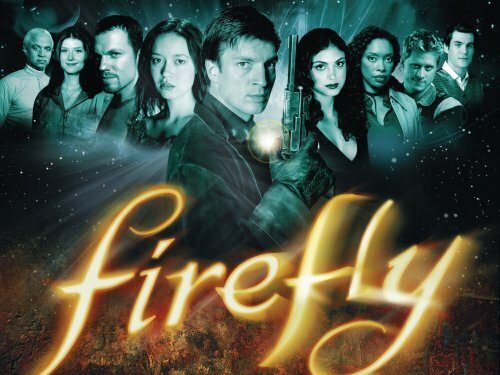 Firefly, like a lot of series, did have some bad episodes. These tend to be glossed over when the second season in showing. Other classic sci-fi series have also suffered from fist season jitters. Star trek and Babylon 5 had them. They survived as they had the viewing figures to survive that critical first season. Babylon 5 was almost cancelled during its run but survived because of fan pressure and good writing. Firefly had two of the three things that any series need. Good writing, acting that wasn’t dreadful. The thing it didn’t have was viewers. When it was getting known on convention circuit things changed – it got the fans that it needed six months previously when it was cancelled after that one , and only, season. Then we are forever reminded that this was the case. It came out on DVD so people could watch it again and again. Get new people involved in watching it and complaining to whoever was nearby about why it shouldn’t have been cancelled. The series did, in a small way, get back to being shown. That being the film serenity. An end. No way back. How could there be as most of the cast were killed off at the end! Like the series it followed. It two didn’t do well at the box office. Almost scraping it’s budget back in ticket sales. In other words, a huge loss if you include promotional costs, of an estimated $10 million, in as well.